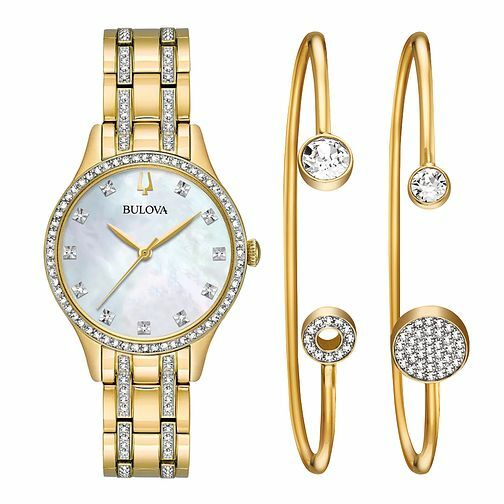 Exude elegance with this Bulova ladies' gold-tone stainless steel watch and bangles 3-piece set. This stunning watch is alight with no less than 111 Swarovski® Crystals on the case, bracelet and white mother-of-pearl three-hand dial. Crafted with flat mineral crystal, a short fold-over pusher closure, quartz movement, and water resistancy up to 30 metres. The perfect co-ordinating pair of bangles is made of gold-tone stainless steel with flexible memory wire, and complete with a total of 51 Swarovski® Crystals. Watch Diametre: 32mm, Thickness: 6mm.